Heliotrop was founded in 2009 by graduate engineers and MBAs, with strong technical, industrial and market knowledge, passionate about making solar power available for everyone. Heliotrop comes from an ancient greek word which means ‘Sunflower’. 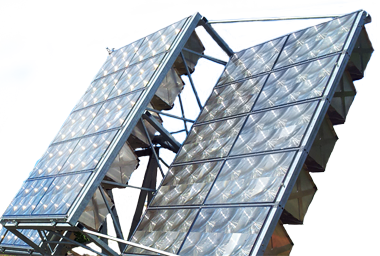 Heliotrop’s mission is to design solar energy systems which are competitive with traditional fossil fuel sources. To achieve this goal, Heliotrop has developed leading concentrator photovoltaic (CPV) technology which combines high-efficiency solar cells (> 40%) and low cost manufacturing. Heliotrop is headquartered in Lyons, with offices in Paris (France). The company has developed a concentrated photovoltaic (CPV) solar system that results in a lower cost per watt due to its higher concentration level (x1024), innovative design and optimized manufacturing process. Heliotrop invests heavily in R&D with key characteristics of the research include: III/V cells packaging, thermal management optimization, optical design, mechanical design, reliability and aging characterization. Heliotrop’s strategy is to act as a CPV system manufacturer through integration of the various industrial components required to produce bespoke CPV units. Each of the manufacturing steps relies on specific patents which form part of the Heliotrop intellectual property. Heliotrop has partnered with key manufacturers with strong know how in assembly of cells, modules and trackers. The low cost patented manufacturing process allows Heliotrop to build new production lines closed to its markets, providing “local energy with local jobs”. In 2010, Heliotrop is awarded Grand Prix de l’innovation from the city of Paris and Prix Special du Jury from CleanTech Republic. In 2011, the French government, through its State agency ADEME, provided €16 million of grants to Heliotrop’s industrial and R&D partners. This package is part of a €44 million investment plan relating to Heliotrop’s initial R&D, pilot production and first unit deployment. In 2012, solar power operators using Heliotrop systems won more than 50% of the french call for tender for solar farms with CPV technology. These operators will deploy the Heliotrop technology in 2013 and 2014. In 2013, Heliotrop starts its international expansion focusing on some of the targeted areas ie: Middle East, North Africa and North America.